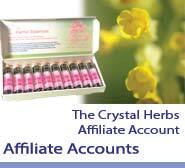 Many thanks for your interest in the Crystal Herbs affiliate program. You can apply here for a Crystal Herbs affiliate account and earn a 15% commision on sales generated through your affiliate links. If you have not ordered online with us before, please go to 'My Account' and create an online account for yourself. This is the account that will be authorised as your Affiliate Account. Once you have an online account, please complete all fields to apply for your Affiliate Account. Please complete all fields to apply for your Affiliate Account. How you would prefer to receive your commission ( please note the Bank Transfer option is for U.K. bank accounts only ). Thank you for completing the Affiliate Account Application form. To complete your application, please click submit, and we will respond to your application as soon as possible.